Sciatic Nerve Pain is one of the most excruciating and down right annoying issues that at least 40% of people will experience at some point in their life. The sciatic nerve travels from the L4-S3 and innervates the skin and muscles of the thigh leg and foot. 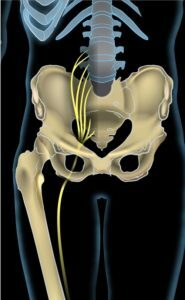 Where the sciatic nerve exits the pelvis on its journey down the leg it travels past a small muscle in the gluteal region called the Piriformis. The piriformis muscle tends to pick up the slack if the glutes become lax, a very common problem in runners. When this muscle becomes tight and over contracted it pushes on the sciatic nerve which causes serious discomfort. Releasing this muscle will relieve the pressure its putting on the nerve! At Massage Therapy of Boston we specialize in Deep Tissue and Sports Massage, manual therapy is the fastest way to get relief from this nuisance. Here is very helpful article in keeping up with self care techniques at home!